The awards ceremony will take place after the 1K Kids Fun Run at approximately 11:30 am. There will be activities for the kids and refreshments for everyone. A special closing ceremony is planned involving all veterans, active duty military, Reservists and National Guard members. As part of DigElog ROCORI’s extended coverage of the 2nd annual Old Glory Run, we had a chance to catch up with John Swanson, one of the inspirations for the Old Glory Run. Swanson, a 10-year military veteran lost his leg in combat. Humble by nature, he often tries to avoid the spotlight but at the same time understands the importance of sharing his story. Like so many other veterans, he appreciates the efforts of people like Curt and Pam Karls that go the extra mile to help reintegrate returning soldiers back into society. In this story, Swanson discusses how life has changed for him since the last time we saw him. He also shares how the Disabled American Veterans (D.A.V.) has helped with his medical issues over the past year. For those that are not familiar with the Old Glory Run, all proceeds from the event are donated to the Minnesota Chapter of the D.A.V. This is a must see story, and as the 4th of July approaches it is a great reminder of the sacrifices that others make for our freedom. "A Solute To Those Who Serve!" Join us on May 21st for the 4th Annual Old Glory Run - A Salute to Those who Serve! - Registrations will not be accepted on race day. Online registration will end at 12:00 pm CDT on Friday, May 20th. - The original 5k route is back! May 22, 2010 - The Old Glory Run: Sign Up Now! While it will be tough to top last year's event, the Karls as well as the other organizers of the Old Glory Run will do their best to do so. "We are truly excited to offer this event to those who support our troops and especially to all of the men and women in uniform - past and present. The Old Glory Run raised $16,000 in 2009 and $14,000 in 2008, which was donated to our local chapter of the Disabled American Veterans (DAV) organization. Our goal for the 3rd annual Old Glory Run is to raise $25,000 to help offset costs for a new van for the DAV. This van is used to provide free transportation for area veterans for medical appointments." Click here to visit the official Old Glory Run website. View other stories sponsored by Tom Graham Insurance Agency Inc. 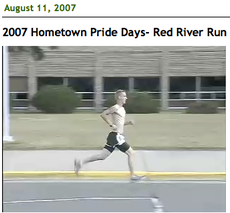 In our third year of coverage at Hometown Pride Days, DigElog ROCORI has witnessed, as well as captured the tremendous growth of the Red River Run. In this story, you’ll get a chance to see the participants of the 1k, 5k, and 10k run. You’ll also hear from a couple of the participants. 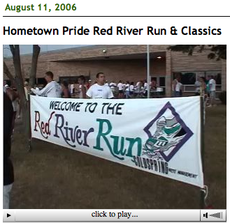 One of them has been doing this for years and the other participated in the Red River Run for the first time, but boasted that she’d surely come back and do it again. Thanks to all that help out with this fantastic event. Be sure to come out and support the first annual Rockfest Rock-Run on Saturday August 23. For more information on Rock-Run stay tuned to DigElog ROCORI.